He’s still dancing, he’s still talking trash. But as training camp begins, Cam Newton is at a crossroads. The Panthers’ offense is evolving, moving away from the approach that made Newton NFL MVP just two seasons ago. Now, the quarterback’s future hinges on one question: Can Cam change? CHARLOTTE, N.C. — Cam Newton is stuck in Motown Hell. The Carolina Panthers normally stretch and warmup to rap music—the occasional Kings of Leon is thrown in for friend-of-the-band Greg Olsen—and Newton is usually dancing during this two-to-three song timeframe, because he’s done already extensive stretching inside the building before practice. But on this Thursday in June, the last day of veteran minicamp, The Temptation’s “Just My Imagination” is filling the Panthers’ practice field and the quarterback wants none of it. “I’ll give you $100 to put on some Future or some damn Young Thug,” Newton shouts to the low-level staffer with the aux cord, a young man visibly caught between the $103.8 million quarterback and those who employ him. Panthers coach Ron Rivera will later say that this was simply Throwback Thursday, as voted on by the coaches, though local reporters are struggling to remember a time in the past seven years when coaches took over the music. A more popular (and plausible) theory is that Jerry Richardson, the octogenarian owner/founder of the Carolina Panthers, is about to make an appearance on his golf cart to see first-round pick Christian McCaffrey in action, and perhaps Motown would be more palatable than Future or some damn Young Thug. Less than an hour into practice, it doesn’t matter if Richardson is on his hip or not. Newton is chest-bumping running backs, commending Kelvin Benjamin for boxing out an overmatched cornerback and constantly prodding the defense. It’s the same Cam Newton we’ve seen since he entered the league seven years ago, even if so many want to change him. There’s no mistake that change is coming to Carolina, though. All signs point to the Panthers transitioning away from its deep-ball offense and designed quarterback runs, two of the staples of an offense that helped make Newton a superstar. This spring the Panthers added McCaffrey and speedy second-rounder Curtis Samuel to the squad in what looks to be a clear attempt to get faster on offense and the ball out of Newton’s hand more quickly. The average observer might think of it as an easy change. But it’s a drastic transition for a quarterback to make mid-career, and the fate of a coaching staff could hang in the balance. Central to all this is one simple question: Can Cam change? When the Panthers touched down in the Bay Area a week before Super Bowl 50, they were coming off two postseason wins featuring a combined 90 points of offense and a 17-1 cumulative record. Newton was named NFL MVP the night before the game, commanding 48 of the 50 total votes. Wade Phillips, the Broncos’ defensive coordinator that season, shudders at the idea that he broke the code to stopping the Panthers. But the decline of Carolina and Newton can be traced back to that Sunday evening at Levi’s Stadium when the newly crowned MVP became newly humbled with an 18-of-41 passing performance, leading just one touchdown drive, throwing an interception and absorbing six sacks in the 24-10 loss to Denver. First, Phillips says, his defense was skilled all year long at taking away what Carolina did best. The Broncos held opponents to a league-low 3.3 yards per rush, and Carolina’s offense was predicated on a diversified running game that opened up the passing game. Second, that defense had stopped future Hall of Famers Ben Roethlisberger and Tom Brady in the playoffs, and both are better passers than Newton. Denver put the Panthers into 12 third-and-8-or-longer situations, then blitzed Carolina into its worst offensive performance of the year at the worst possible time. “He’s not that young guy that we can throw out there and say, ‘Go do your thing,’” Rivera says. But it was Phillips’ keen film eye that saw an opportunity for his Broncos. Newton wasn’t much of an improvisational scrambler in 2015, so Phillips sent green-dog blitzers—meaning a blitzer only came when he was sure the back or tight end that he would otherwise be responsible for in coverage was staying in to block. Those blockers were supposed to help tackles Michael Oher and Mike Remmers against Von Miller and Friends, but Phillips’ tack took that help away and forced the Panthers’ offensive linemen to win one-on-ones, a near-impossible task against the Broncos’ stout pass rush. The result was six sacks (including two strip sacks) and 13 knockdowns of Newton. • The MMQB 400: Analyst Andy Benoit’s ranking of football’s top players for 2017. The hits, both literal and figurative, kept coming for Newton in 2016. For all of Rivera’s complaints about the league sending the NFC champs on the road for a Super Bowl rematch to start the season, the Panthers would have left Denver with a win had Graham Gano’s last-second, 50-yard attempt in the thin air not sailed wide left. 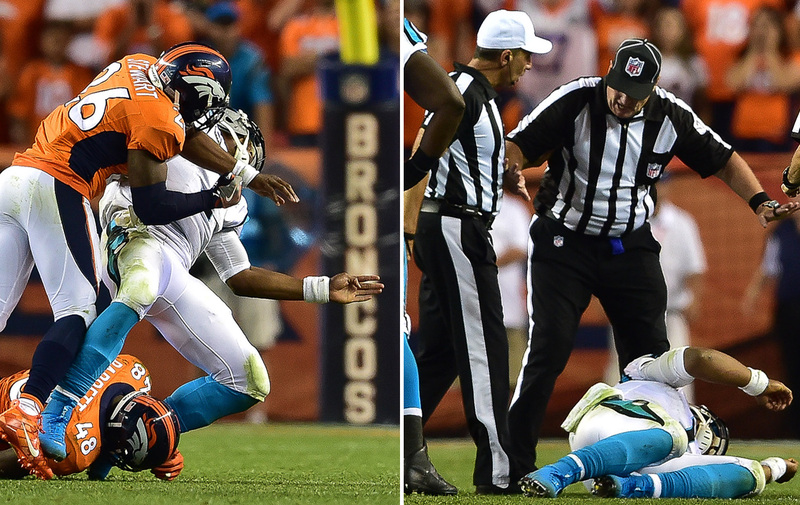 That September night, Denver defenders made Newton’s head a piñata and the officials allowed it. (He took at least four hits to his helmet during the game with just one being flagged.) Three weeks later Newton took a vicious but legal hit as he walked into the end zone for a two-point conversion against the Falcons. A few weeks after returning from a concussion that kept him out of a primetime home loss to Tampa Bay, he bemoaned late and low hits by Cardinals defenders. Newton protested enough to demand Roger Goodell pick up his phone. Newton, who through a team spokesman declined comment for this story, could still stand after those hits, but some of his teammates weren’t as fortunate. Oher, the starting left tackle, suffered a concussion some time around Week 2 and missed the last 13 games (released by the Panthers last week, he might never play football again). Center Ryan Kalil injured his right shoulder and missed the last half the season. Receiver Kelvin Benjamin, returning from an ACL tear suffered during 2015 training camp, was overburdened and overwhelmed on the field and fell off after September. Newton wasn’t stellar early on; a career 59.6% passer coming into the year, he was at 57.7% at the season’s midpoint. Newton took a number of head shots in last year's season opener, including this one from Denver safety Darian Stewart. By the end of the Week 6 loss in New Orleans, Newton’s first game back from his concussion, it was clear Carolina didn’t have the horses to make a fourth-straight playoff run. The 1-4 Panthers trailed 31-17 at the Superdome after three quarters. Newton rallied the offense with a 21-point fourth quarter, tying the game at 38 with less than three minutes to play only to see the defense—specifically Carolina’s green secondary—squander the comeback in a 41-38 loss. Of course, insult must always follow injury. Russell Wilson is Newton’s rival on the field and antithesis off: Newton is boisterous, colorful and full of braggadocio. Wilson is more muted and traditionally corporate. Both are transcendent young talents, and they were Super Bowl losers in consecutive years. Wilson took questions after his heartbreaking Super Bowl XLIX loss. Newton sulked through his abbreviated post-Super Bowl 50 presser, for which he’s still criticized today. For Newton to not start against Wilson and the Seahawks on Sunday Night Football was embarrassing enough, but for it to be because the fashionista broke a fashion-related team rule only added to the humiliation. Newton didn’t wear a tie as the team boarded the plane to Seattle and was benched for the first series of the game. That series lasted one play, as Anderson threw a short pass to Mike Tolbert that glanced off the fullback and into the hands of Seahawks linebacker Mike Morgan, a rough start in an eventual 40-7 loss. “We have rules, and I think Ron did the right thing,” Anderson says. “You’ve got to treat everybody the same way. I think Cam understands that. It wasn’t as big a deal as you guys made it. Unfortunately it happened on a Sunday night game and everyone in the world was watching. And unfortunately that ball bounces off Mike and they pick it and then now it becomes a bigger issue. It just looks bad. When Newton injured his throwing shoulder—eventually requiring surgery in March—in Week 14 on a tackle attempt to prevent a touchdown, the Panthers were 5-8 and still had a chance of making the playoffs, just like they did in 2014 when they finished 7-8-1. Rivera held on to those hopes (250,000-to-1 odds) going into a Monday night game in Washington, and Newton, who doctors said couldn’t damage the shoulder any further, played one of his best games of the season. The Panthers needed 10 games to break exactly one way the following week against Atlanta. They were eliminated before their Week 16 loss to the Falcons was complete. The shoulder started to give out on him in Week 17 in Tampa Bay. Early in the third quarter Newton threw the weakest comeback route he’s probably ever made, his second of three interceptions that day; Bucs cornerback Brent Grimes picked it off and walked into the end zone untouched. 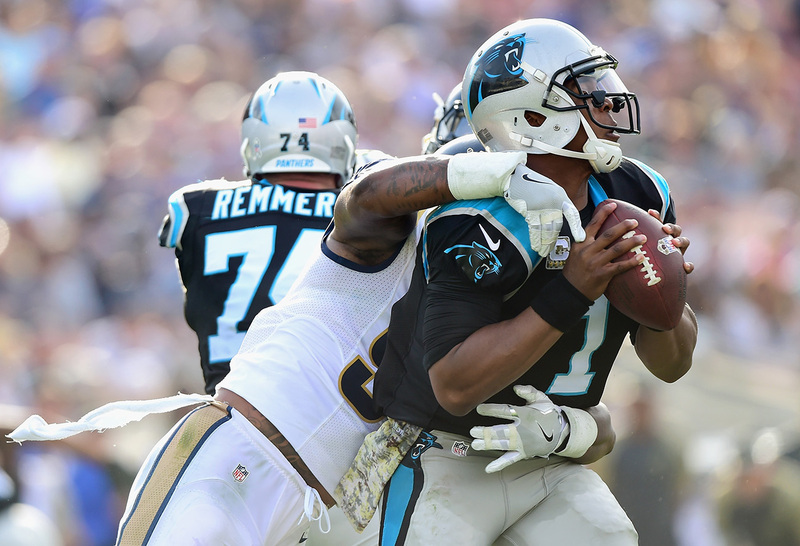 Even with Anderson out with an illness, Rivera still wanted to pull Newton in favor of third-stringer Joe Webb but Newton resisted. “I’m doing this for the other guys who can’t play because they’re hurt,” Newton told his coaches on the sideline. “I’m doing it because I can play.” Newton led a late touchdown drive, hitting Benjamin for a 5-yard score with 17 seconds left to trail 17-16. Carolina went for two but couldn’t convert, sealing the Panthers’ first 10-loss season since Newton’s 2011 rookie season. His mechanics deteriorated while facing heavy pressure behind a makeshift line in the season’s second half. By the end of the nightmare year he had completed a career-low 52.9% of his attempts, with a sub-80 passer rating (75.8) for the first time in his career. One year after a combined 45 touchdowns as a passer and runner, he accounted for only 24. • TOM BRADY TURNS 40: How the quarterback has established himself as an ageless wonder. 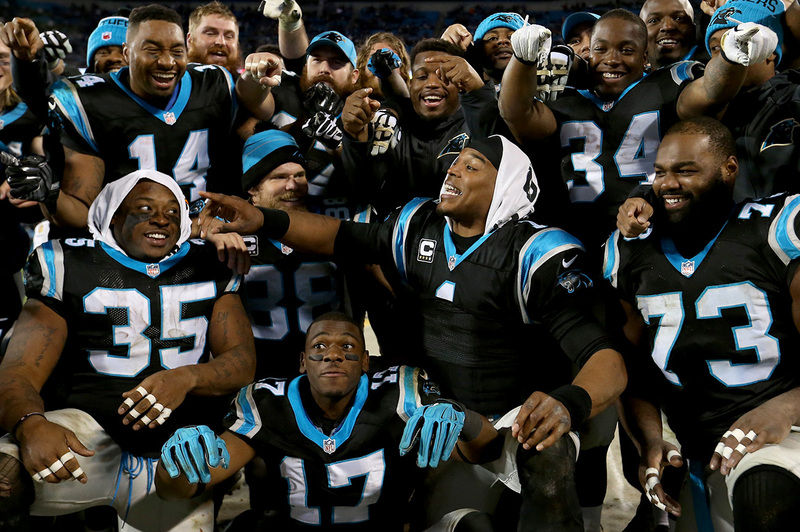 Two topics would dominate the Panthers’ exit interview with Newton. First was possible shoulder surgery. Carolina didn’t want to operate on the quarterback’s throwing shoulder if it didn’t have to, so the idea was to rest him for two months then re-evaluate his partially torn rotator cuff. Second was Newton’s plans away from football. Many within the Panthers’ organization whispered that Newton had too much on his plate the previous off-season. Concurrent with dealing with his biggest professional loss in the Super Bowl was managing his greatest personal gain of becoming a first-time dad. He moved to Los Angeles for several months in the spring of 2016 to film his Nickelodeon kids’ show, part of his years-long effort to be more than a football player. He continued his charity work, which includes his own 7-on-7 summer tournaments across the southeast before taking his top team (which once included Deshaun Watson) to a national tournament in Florida. His business interests grew with his talent agency WME-IMG’s acquisition of the UFC, of which Newton became a partial owner. Under Armour designed an ad campaign for Newton to kick off the 2016 season with the theme “Prince With 1,000 Enemies.” Subtle, it was not. The first sign of change is the physical transformation. 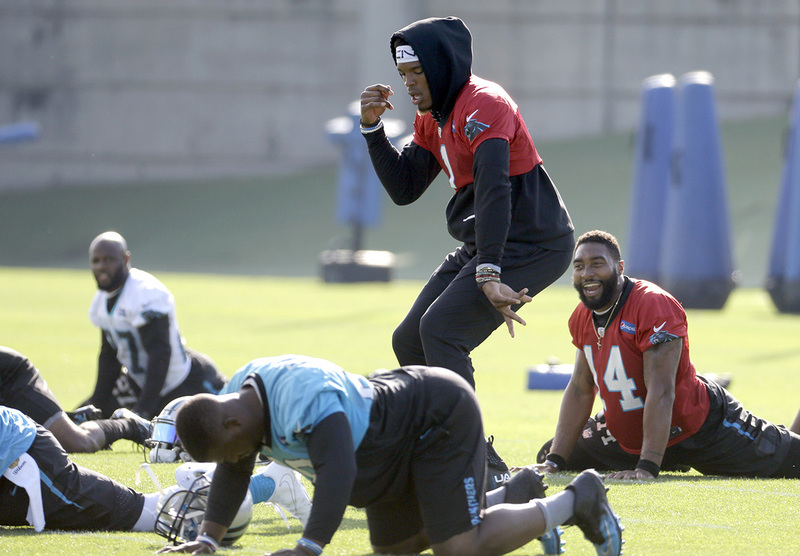 Each day at OTAs and minicamp this summer, Newton showed up in the North Carolina heat and humidity in black sweats underneath his red jersey. He left the field each day drenched without throwing a single football in the two-hour sessions. Two years ago, Newton said he hadn’t played at his listed weight of 245 pounds since college, and last year he played at his heaviest (more than 260, one source said). He wasn’t out of shape, but rather he packed on the pounds so he could absorb the hits, a coach said. On Monday, Newton posted a picture of his lean physique to Instagram with a Jay-Z inspired caption, “Sometimes you need your ego, got to remind these fools who they effin with.” A day later, Rivera gleefully told reporters that Newton checked into camp at 246 pounds. “That’s why the things we talk about changing and doing some things differently are important,” Rivera says. “Now he’s at that point in his career where everything we do with him we have to do judicially if he’s going to run the ball. It has to be the right situation and circumstances. We have to be aware of that. Panthers coaches say they aren’t throwing out the zone read, but clearly Carolina wants to better protect their 28-year-old franchise quarterback. Newton’s 689 career rushing attempts are the most ever by a quarterback through his first six seasons, and only eight players have ever taken more sacks through six years than he has. So far in his career, his value as a runner has added significant value to Carolina’s offense. He’s the only quarterback in recent memory to be featured consistently on power running plays, forcing the defense to account for all 11 players in the run game (in most offenses, the quarterback hands off then falls out of the play). Despite his reputation, Newton is not a run-first quarterback, or even eager to pull it down and scramble on passing plays. But his legs do provide a safety valve option. However, time will win. His legs will wear down. His body is showing signs of breaking down. In the past three years he’s endured ankle surgery, cracked ribs, a fractured back, one known concussion and surgery on his throwing shoulder. • WHY THE STEELERS SHOULD SECRETLY WANT LE’VEON BELL TO HOLD OUT: Business of Football columnist Andrew Brandt on why Bell missing time could be in Pittsburgh’s best interest. This is Operation Reprogram Cam. Jerry West, the basketball Hall of Famer and friend of Richardson’s, once talked to Newton about “taking the layups” and just getting the ball out of his hands. Newton, whose completion rate dipped below 50% in five games during a six-game stretch last season, is one of the NFL’s foremost downfield throwers (his 82 deep-ball attempts, throws that travel at least 20 yards in the air, in 2015 were fourth-most in the league, and his 76 last year were ninth-most) but McCaffrey and Samuel, two top-40 picks, won’t be going on those sorts of routes. Carolina can draw from the Steelers’ reimaging of Roethlisberger in 2012, when Todd Haley took over as offensive coordinator. In the early part of his career, Roethlisberger’s M.O. was to extend plays by absorbing and shrugging off pass rushers, then making big plays late in the down. As effective as that was, it took a physical toll; he made it through 16 regular-season games just once in his eight seasons as a 20-something. For Roethlisberger’s age-30 season, the Steelers replaced offensive coordinator Bruce Arians with Haley and instituted a quick-strike passing offense, hoping to keep the big-bodied quarterback from taking so many hits and therefore elongating his career. Roethlisberger has had two 16-game regular seasons in the five he’s played under Haley. But the Steelers, coming off back-to-back 12-win seasons—including a Super Bowl XLV appearance—when Haley arrived, had consecutive eight-win, no-playoff years to start Haley’s tenure. Carolina wants to avoid that kind of short-term downturn, as well as the well-publicized growing pains that Roethlisberger and Haley went through before Pittsburgh grew into a top-five passing offense for three straight years. Newton campaigned for McCaffrey over Leonard Fournette, believing McCaffrey could offer something the Panthers have never had before. “Where Cam’s had the greatest success is using that deep-field accuracy to his advantage,” soon-to-be Hall of Fame quarterback and NFL Network analyst Kurt Warner says. “Where he hasn’t been as good is seeing and making the quicker decision, and the underneath throws have never really been a part of their game. To say that he can’t do it, I’m not going to say that. It doesn’t seem to be what his strength is. • RON RIVERA ON THE PANTHERS’ GM CHANGE: The head coach weighed in after a wild week in Carolina. The man ultimately responsible for getting McCaffrey and Samuel to Charlotte is now gone. The Panthers fired general manager Dave Gettleman last week after his poor bedside manner wore out its welcome (despite it, in part, helping Carolina go to three consecutive postseasons). If McCaffrey and Samuel—and for that matter the entire Panthers offense—can’t turn things around this season, the next person to follow Gettleman could be offensive coordinator Mike Shula. Rivera has long had Shula’s back. During an interview with The MMQB, the head coach points out that Carolina’s offense had improved steadily year-to-year from 2013 to ’15 with only a minor hiccup related to injuries in 2014. But team sources say Shula won’t get much rope from the owner, who just reminded everyone how swiftly he can write a pink slip, if the rest of the NFL continues to keep pace with the Panthers. The NFL is cyclical. For instance, defenses have reacted to faster offenses with smaller, faster linebackers, and some offenses are beginning to respond with bigger backs and offensive linemen to re-establish the power running game. Within those cycles, trends come and go. The Wildcat stayed in the league as long as a fifth-round cornerback. The read-option has nearly fizzled out after a half-decade. Shula had built something unique in Carolina, but this might have been inevitable. Playing behind a injury-ravaged front five, Newton was under constant pressure in 2016. Panthers coaches have been mum all off-season about how McCaffrey will be used. He’ll be a running back but won’t take away carries from Jonathan Stewart, who campaigned for Carolina to select the Stanford back. He’ll be split out wide and in the slot often, both as a receiver and a decoy to unmask the defense’s intentions. Beyond that, little is known because McCaffrey was allowed to attend just one minicamp practice due to Stanford being on the quarter system. And in that single practice he only caught passes from Anderson. This past weekend, Newton invited most of his receivers, including McCaffrey, to Baltimore for an annual pre-camp visit to Under Armour facilities for a workout. But this wasn’t the first time the two had worked together. The week before, during Newton’s 7-on-7 tournament in Atlanta, McCaffrey visited Newton. While the region’s top high schoolers battled for the trophy on three football fields split into six 50-yard fields, Newton and McCaffrey used a fourth field to work on routes and timing. There’s a certain amount of humility involved for any player, two years removed from such a spectacular season, to move away from what had worked so well. It is especially difficult for a player like Newton, who has a sizeable ego. But according to those inside the Panthers building, Newton is embracing the change. More than that, he invited it. Newton campaigned pre-draft for McCaffrey over Leonard Fournette, according to a team source, because he believed Fournette was too similar to Stewart and that McCaffrey could offer something the Panthers have never had before. Newton does not have Kobe-like pull in this organization but clearly his input matters. Everyone there has hitched their wagon to him, from the owner who, 24 years ago, promised Charlotte a Super Bowl in the first 10 years of the franchise, to Rivera who, after a dozen or so job interviews, got his first head coaching job in 2011 and four months later joined Newton at the hip, to those in uniform who swear by him. 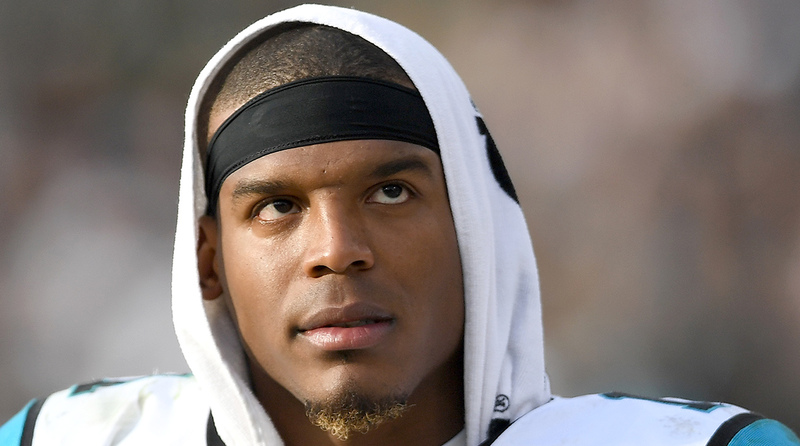 Many within the Panthers’ organization whispered that Newton had too much on his plate last off-season. It’s not the dazzling playmaking or even the dancing at practice that endears him to teammates, but rather it’s his refusal to throw anyone under the bus. He won’t assign blame to anyone other than himself in a press conference no matter how obvious it is. And his coaches have to use unique interrogation techniques with him to understand what went wrong on a play even in the film room. It’s for his childhood friends, a person close to him said, that Newton starred in his own birthday video lip-synching 2 Chainz’ “Birthday Song,” which has the memorable line “All I want for my birthday is a big booty ho” (Newton edited out that last word). It seems a paradox that Newton, the executive producer of a children’s show (Nickelodeon’s “All In with Cam Newton”), would put out that kind of video. But his personality remains rigid and he doesn’t bend to critics; that’s a big reason why, over the rocky 18 months since Super Bowl 50 slipped away, he has kept the near unconditional support of teammates. Newton has always been exceedingly popular with teammates. It’s the end of June’s veteran minicamp, and it’s the same ol’ Cam. Even though Newton can’t throw, his trash talk is out in full force. The same trash talk that led to him fighting Josh Norman during training camp two years ago, on the eve of the 15-1 season. He shouts after Russell Shepard’s diving catch of an Anderson pass against second-year corner Zack Sanchez. He runs from a field away to watch a scuffle between Anderson and veteran defensive back Captain Munnerlyn. And he sings, off-key, “THE BOYSSSSSS ARE BACK IN TOWN” after Kelvin Benjamin snatches a ball out of the air. Newton isn’t cleared for full practice this camp but he’ll be under center, in control, soon enough. Quarterbacks have immense power when they take the snap, and under duress they can revert to their bad habits. Newton trusts his powerful arm so much that his mechanics and footwork will sometimes fail him. Around the Panthers, the feeling is Newton will use this power for good and that he’s bought into what they’re trying to do with him—and for him. He is going to keep on dancing and keep on jawing with opponents and teammates alike through another season. But you have to look closer and listen closer, like Rivera is, to pick up on the most important thing the quarterback says all day. With Newton standing behind the action during team drills, Anderson takes the snap on a play that has slow-developing options downfield. Fozzy Whittaker, a seldom used scatback, comes out of the backfield wide and then makes a cut inside, just beyond the line of scrimmage. Newton, so used to launching the ball downfield over the first six seasons of his career, sees it. “Fozzy … Fozzy,” he mutters under his breath.